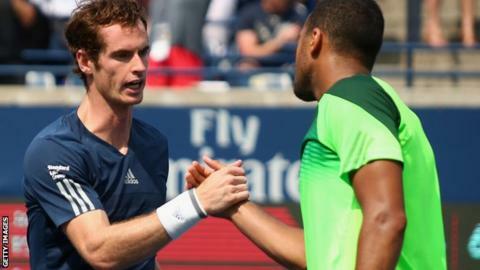 Andy Murray's US Open preparations suffered a blow as he lost 7-6 (7-5) 4-6 6-4 to Jo-Wilfried Tsonga in the Rogers Cup quarter-finals. The Briton let slip a 3-0 lead in the final set as the Frenchman beat him for only the second time in 11 meetings. Murray, 27, is still without a title since winning Wimbledon last year. The Scot now moves on to his final tournament before the US Open, the Western & Southern Open in Cincinnati, which starts on Monday. "I thought it was a high-level match with a few games by both of us in the second and third sets that were a bit scrappy," said Murray. "Jo is a top player. He's a fantastic athlete. When his game is on, he's very tough to beat." Eighth seed Murray, who smashed his racquet in frustration at the end of the match, will be ruing a lost opportunity, as he appeared in total control after winning five games in a row from 4-4 in the second set. However, he then lost five in a row himself as Tsonga, who defeated world number one Novak Djokovic in the previous round, took advantage of some sloppy play from the two-time Grand Slam champion. The first set was dominated by serve, with each player saving one break point but otherwise not being threatened before the tiebreak, which Tsonga took 7-5. Murray struck first in the second set, sending a superb forehand down the line for a 3-1 lead, but gave up the advantage immediately as four errors allowed his French opponent to break back to love. The Scot was then staring defeat in the face as he went 15-40 down when serving at 4-4 but responded brilliantly, winning eight points in a row to not only hold serve but then break Tsonga to love and level the match at one set all. As Murray went 3-0 up in the final set, there appeared to be only one winner, but inconsistency again crept into his game. Serving at 3-3, he saved two break points but Tsonga converted his third opportunity with a forehand volley. Murray subsequently saved three match points at 4-5 down but dumped a backhand into the net when he had an opening at deuce. An ace sealed the victory for the Frenchman, who faces Grigor Dimitrov in the semi-finals on Saturday after the Bulgarian beat Kevin Anderson of South Africa 5-7 7-5 7-6 (8-6). In the remaining quarter-finals, Roger Federer plays David Ferrer, while Milos Raonic takes on Feliciano Lopez.